Dance Barefoot is a free dance training program in Haiti created by choreographer Jeanguy Saintus, which benefits young dancers who cannot afford to pay for dance lessons. It is also a place where they can go express their emotions and the daily challenges they face. Vitolio Jeune joined Dance Barefoot when he was 17 years old. He went on to continue his dance education on a full scholarship at New World School of the Arts in Miami Florida. In 2009 he finished top 14 on So You Think You Can Dance season 5 and now he is a senior dancer with the world-renowned Garth Fagan Dance in Rochester New York. Humanissimus will orchestrate one-week summer dance seminar for Dance Barefoot in Haiti, which will be documented. mentoring project through dance will be taking by visiting the orphanage where Vitolio Jeune grew up (Our Little Brothers and Sisters of St Helen) to encourage groups of young adults to use dance as a form of self-expression. The program will include master classes and creative improvisation that will give them the opportunity to develop their personal style of movement to better express their emotions. The dancers will also attend lectures, engage in dialogue on contemporary dance and Caribbean culture, as well as dance criticism. Vitolio Jeune will also choreograph a new dance for the participants, which will be performed at the end of the seminar. Our goal is to encourage these young dancers to continue to pursue their creative dreams, despite any economic disadvantages. CONTRIBUTE TO HUMANISSIMUS' YOUTH EMPOWERMENT PROJECT THROUGH DANCE! I'm Turenne / Tilarenn. I welcome you warmly in this journey through dance, path of the universal wellness that is conscious movement, with inspirations to fully stir our vital energy and dance your soul. VIEW: In each text, capture the vital and creative energy that best convey Soul Dances Spirit for our delight. I so fell in love with this post on your blog that I reposted it for our entire small business network. Thank-you for inspiring all of us with your coverage of the strength, beauty and determination of the human spirit and the message to always follow our dreams. Wow! You just made my day Kathryn... I am so happy you enjoy this post! Thank you very much for sharing so generously with your entire group at The Montreal Small Business Network. Have the very best day of your life and, yes, always keep on dancing! Here's your link again for easier acces to all : http://www.meetup.com/MontrealSmallBusinessNetwork/events/72187732/. Thanks for the interesting post. 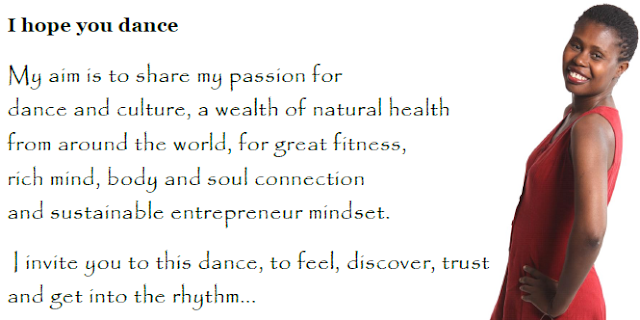 I am also very passionate about natural healing and dance including. So you have my support, I shared your post to my Facebook business page https://www.facebook.com/Aqua.Food Please be welcome to have a look at it. First of all, thank you very much for your support. I really appreciate it. The more the words go around, the better. HUMANISSIMUS is still challenge to reach the goal of only $10 000. I guess people still need to grasp the true impact of this collaboration with Dance Barefoot for a growing number of youth in Haiti. We are working on it... Dance Barefoot's contribution to KENBE LA is a good example of its radiance. People can still be part of the journey through Humanissimus' website (http://www.humanissimus.org/). Also, it is a pleasure to connect with like minded people as you are. I looked at your Facebook business page https://www.facebook.com/Aqua.Food and what I understood caught my attention. I would love to know and understand more. You can use my KONTAK form.